Nothing has changed my life as much as having a terminal illness has. Living with the consistent reminder that I am dying has brought focus to my days in unparalleled ways. This is something we all know intellectually, of course: that contemplating our mortality can help us wake up and appreciate our lives. Poets remind us, Country-Western singers do too. But how can those of us who are not terminally ill reap the benefits, the wisdom, and the guidance of chronic illness without being sick? 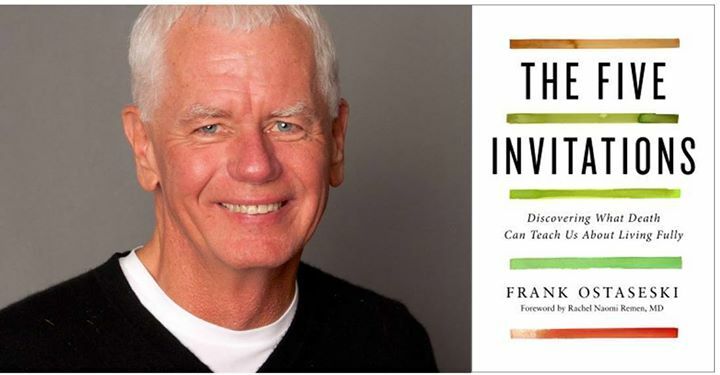 Frank Ostaseski’s The Five Invitations: Discovering What Death Can Teach Us About Living Fully provides a textbook for those of us desiring to engage in this study before we are forced to do so through our final diagnosis. Ostaseski has been a student of this material for decades. Co-founder of the Zen Hospice Project in San Francisco, a model for compassionate and mindful end-of-life care, he has supported dying patients for decades. Having amassed stories and experiences few of us can even contemplate, Ostaseski shares the fruits of these encounters with us in hopes that we may benefit from them as we learn to let death be our teacher about life. The Five Invitations are just that – the five central offerings Ostaseski finds inherent in the dying process, five gifts that the dying may have and that we may utilize to be more present to our living. Each of these is both simple and incredibly challenging to consistently implement: Don’t Wait; Welcome Everything, Push Away Nothing; Bring Your Whole Self to the Experience; Find a Place of Rest in the Middle of Things; Cultivate Don’t Know Mind. They are likely invitations we each have received before, perhaps from a wise elder reminding us about what is significant in life or through religious texts, even by way of popular movies and books. The struggle is that we receive these messages, contemplate them, and then often move back into our habitual ways of being. What actually changes us is not thinking about things but experiencing them. And since most of us are not having an encounter with dying right now, it is easy to push away the experiences, the thoughts about living and dying. This volume invites us to slow down, to explore the wisdom offered through these invitations, and to allow ourselves to be changed by it. As most great teachers know, secondary to our own experiences in their ability to be impactful are stories that touch us deeply, stories that pull us in, so that we somehow feel as though we are encountering the situations related through them. Ostaseski weaves together such stories from his patients, his co-workers, and from his childhood to illustrate these invitations in a skillful way, one that whispers, “Come here. Sit for a moment. Take this in.” I found myself purposefully slowing down to read this volume, offering myself daily doses of its wisdom; and I was rewarded with rich contemplations and opportunities for heart expansion. The dying have so many things to teach us. Unfortunately, they may not have the physical strength to relay all the wisdom they have amassed. Fortunately, in Frank Ostaseski, they find a masterful ambassador.